For almost 90 years the Wahl company has been making trimmers to help men keep their well groomed look even when grooming at home. The Wahl Lithium Ion all-in-one trimmer is just one of the many products this company offers men. Here is my detailed review of the Wahl lithium ion rechargeable 17 piece grooming kit. we will go into all its good and not so good points in this review. Lots of accessories to give you the kind of trim you need. Accessories pop on and off easily. Blades can rust without proper care. Organizer tray is cheaply made and poorly designed. 1 Features of the Wahl Trimmer All-in-One. Features of the Wahl Trimmer All-in-One. The Wahl All in One Lithium ion Trimmer model 9854-600 is rechargeable and has plenty of features which should make it the ideal trimmer for anyone to tame that wild hair anywhere on his body. Powerful Lithium Ion battery that holds a charge for long time and runs longer than other batteries on today’s market. Only takes 1 hour for a full charge and 5 minutes for a quick charge. Loses almost no battery power when not in use. Auto Shut Off shuts off the charging mechanism when the battery is fully charged. Comes with 3 beard guides. Ears, nose and eyebrow detailer. Trimming their beard and mustache. Hairline, back of neck and sideburns. Like most Wahl trimmers, this Lithium Ion all-in-one trimmer comes with plenty of accessories, which means that when you purchase it, you will almost need a checklist to keep track of everything that comes in the box. Reviews and ratings for the Wahl all-in-one trimmer run between average and good with users having a lot to say about this trimmer. Here are some of the comments you may find useful in deciding if this trimmer is right for you. The majority of users have only good things to say about the cutting quality of these trimmers. Users state that these trimmers give an extremely precise trim and work exceptionally well on both beards and mustaches. Users also find this trimmer works well for shaving heads and even trimming hair. Users seem to be somewhat divided as to the attachments and accessories. While some users like the wide variety of accessories and find them easy to put on and take off, other users feel that there are just too many attachments to keep track of. There is a holding tray, but users find it cheaply made and is not large enough to hold all of the attachments. Like with the attachments, users seem divided on how well the battery in this trimmer functions. Some users state that the trimmer does not hold a charge well, while the majority of users find just the opposite and find that that this trimmer holds the charge extremely well. 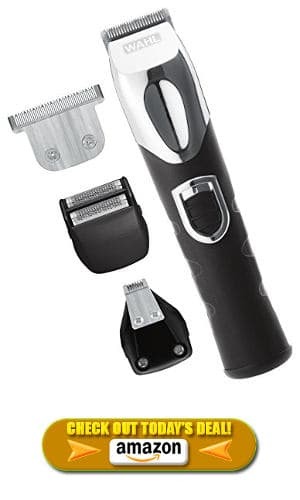 In fact, several users have stated that they still have this trimmer after 3 to 5 years. Users do like that this battery charges in just an hour. Users find the Wahl 9854-600 Lithium All-in-One trimmer to be well designed and built. They feel the trimmer is light weight, but solid although they do feel that the rubber body on trimmer attracts hairs which need cleaning after trimming. Overall, users feel that this trimmer is inexpensive and well worth the cost as this trimmer comes in handy for a large number of trimming needs. While not all users are satisfied with the longevity of this trimmer the majority of users did find that it lasted them long enough to be well worth the price. Majority of the people who purchased the Wahl all-in-one Lithium Ion trimmer really like this trimmer and feel that it does everything or almost everything it is intended to do and does it well. In some cases the customers were disappointed in some of the ways it functioned. However, it does seem that Wahl customer support is very good at working to resolve any problems that people experience and are willing to work with you to help you have a well functioning tool that meets your needs. Overall, the Wahl Lithium Ion all-in-one trimmer seems to be a good trimmer that is reasonably priced and meets the needs of a great majority of the people who have been using it.